Description: Irene Nowell admits that the book of Numbers "rarely makes the top ten list of favorite biblical books." But through her insightful interpretations and practical reflections, readers will gain a new and positive appreciation of the text. With Nowell, readers will relish the harassment and humor of the prophet Balaam and his talking donkey in chapters 22�24. We too are blessed by this delightful and ingenious God who communicates through a loquacious animal. This same God lives and moves with us, meets our needs as we wander through our personal and communal wilderness, defends us against the enemies of our sinfulness better than we can ever do in our weakness and fickleness, and eventually brings us to our promised place of glory. And God wants all of us to "be in that number." 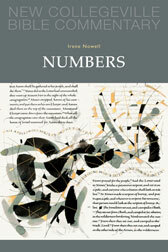 Citation: Timothy R. Ashley, review of Irene Nowell, Numbers, Review of Biblical Literature [http://www.bookreviews.org] (2014).